Whether you're a neighborhood cafe or a major airline, we can help you bring great coffee to your customers. Looking to bring a true specialty coffee experience to your business? We're ready to help with a full-service coffee program that is recognized by companies and consumers across Rwanda for its excellence. A talented barista is key to bringing the amazing flavors found in Question Coffee to life. Our barista instructors are ready to train your staff on the ins-and-outs of coffee brewing, latte art, espresso machine operation, and the story behind our coffees, so you can create a great customer experience. Despite being essential to a top-notch coffee program, quality brewing equipment can be prohibitively expensive and requires upkeep to consistently produce delicious drinks. We have a wide inventory of machines and coffee gear to get you brewing in no time, and offer routine maintenance to keep everything running smoothly. We work with only the finest equipment in the industry, and are official distributors for leading brands La Marzocco, Mazzer, Bunn, Bonavita, and Nuova Simonelli. A cup of coffee can only be as good as the beans it was brewed from. 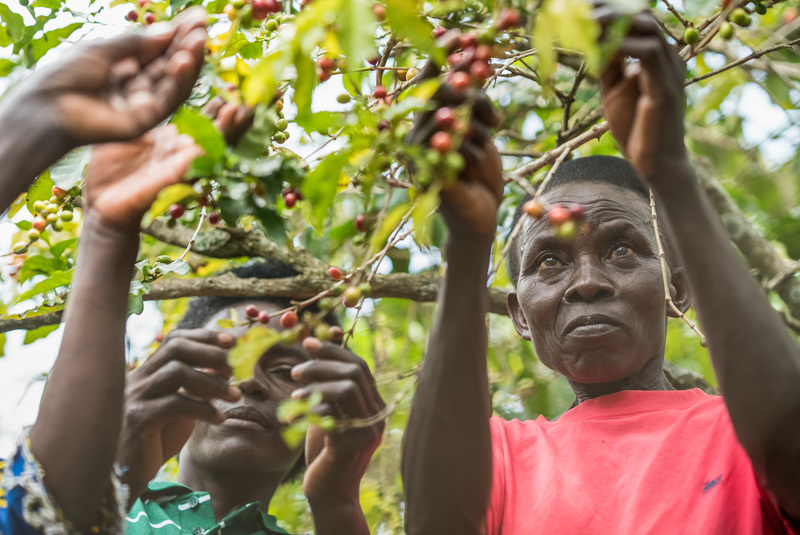 We are passionate about sourcing high-quality Rwandan coffees and creating impact through our purchases. We take pride in our craft, small-batch roasting, and are committed to serving up only the finest coffees the country has to offer. When you choose to serve Question Coffee, you bring unmatched coffee excellence to your customer's cup, creating a memorable experience that empowers your brand. We're proud to service some of the biggest names in Rwandan hospitality, restaurants, and food service. 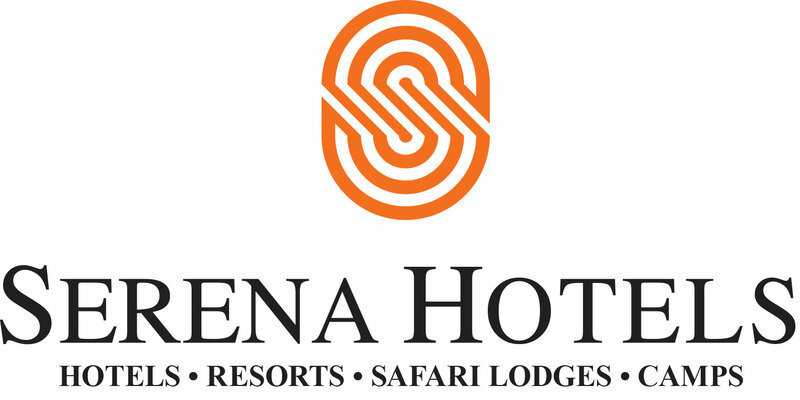 As the leading pan-African luxury hotel brand, Serena needs to deliver a world-class experience steeped in local flavor. Serena Hotels needed a coffee solution that reached beyond the cup and into their guests' hearts and imagination. 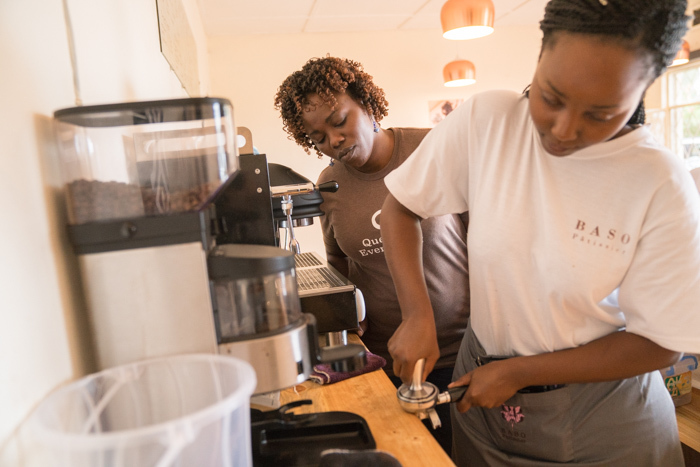 After creating their signature blend, the Serena staff were trained not only on coffee preparation by our staff, but also on storytelling by the women farmers. These stories, along with thoughtfully placed marketing materials, have created an environment of curiosity and wanderlust, inspiring guests to take a trip outside of the city to visit the coffee farmers who supply the hotel's signature blend. 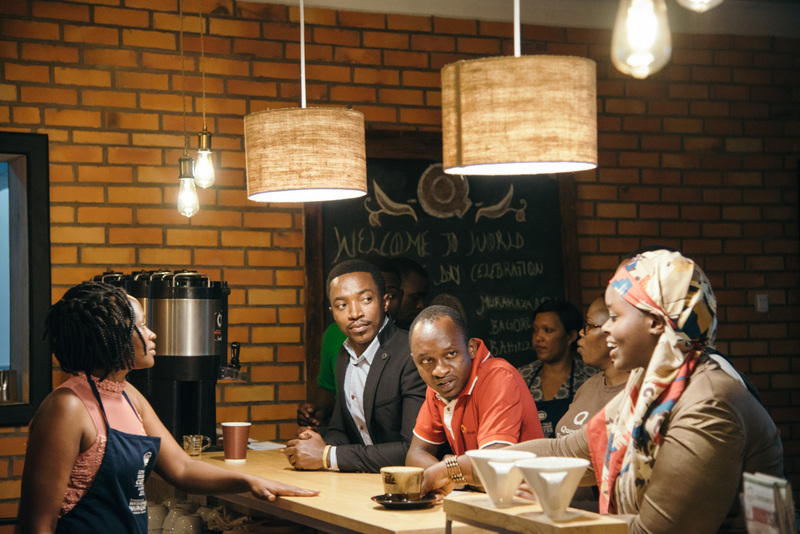 RwandAir came to us with a remarkable idea: the best coffee grown in Rwanda, served in the sky. This took activating a network spanning from the Middle East, Europe, and Central America to create a specialty-grade, women-grown, soluble coffee product, delivered in 100% biodegradable packaging. 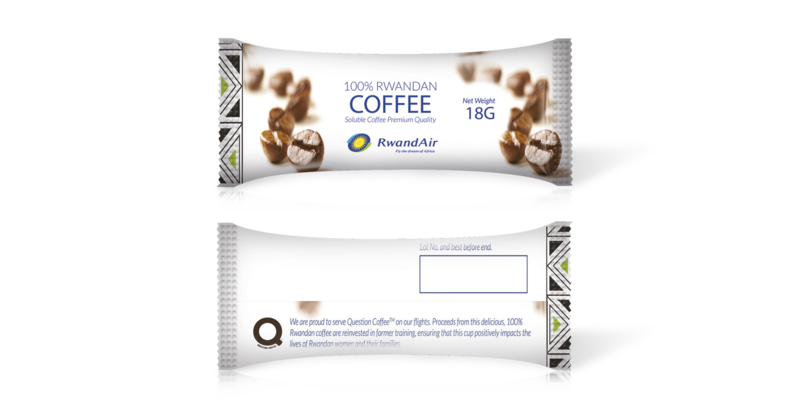 Question Coffee is served on all RwandAir flights, and is included in the airline's business class gift bags, which showcase Rwanda's best products . 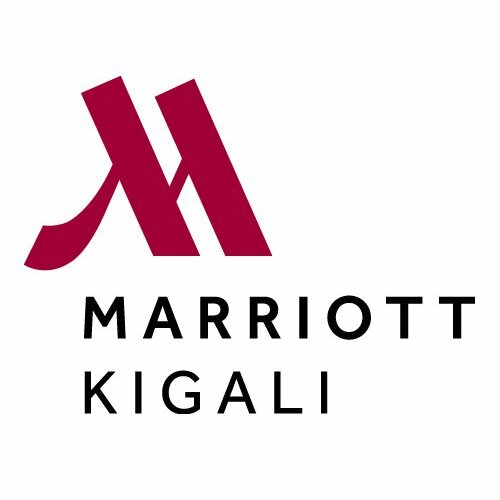 Marriott entered Rwanda in 2015 with their first sub-saharan property. Bringing the standards of an unparalleled collection of worldwide brands to a new territory comes with unimaginable uncertainty, and most organizations rely on importing existing products from trusted suppliers. Marriott took a different approach and entrusted several local suppliers with filling their hotel offerings. 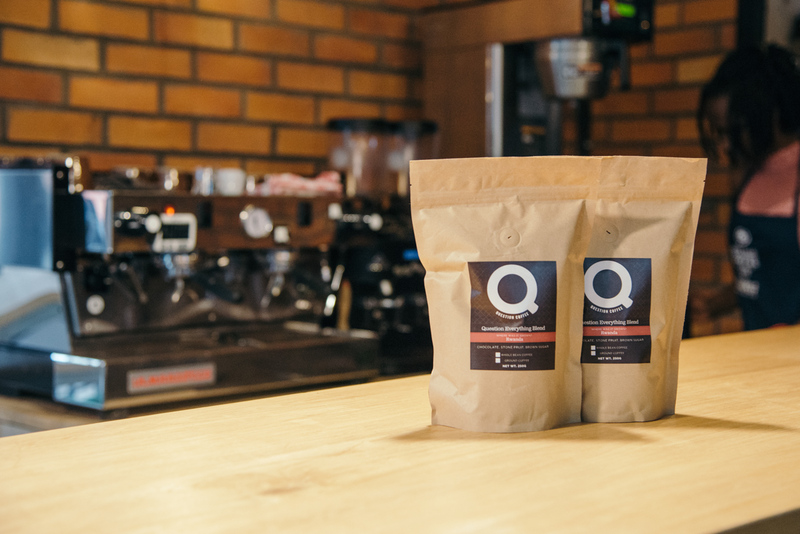 In order to meet strict quality demands, Question Coffee conducted taste experiments across local and global management to ensure their coffee had a local profile, while meeting international brand standards and expectations. This unique partnership was showcased on the opening night of the hotel, when women farmers filled the lobby and shared their craft from seed to cup with hotel staff and patrons. Africa Parks, the management company of Akagera National Park, seeks out innovative revenue streams in order to fund their conservation efforts. We approached AP with a new way to deliver coffee to the thousands of guests arriving to the park entrance before 7:00 a.m. We helped AP to source the right equipment to deliver a world-class, sustainable source of revenue using coffee grown by women less than 20 km from the entrance of the park. Visitors to the park can now enjoy lattes and cappuccinos using 100% local ingredients or purchase a unique souvenir like the "Big 5 Espresso Blend" and "Giraffe Decaf" from the park gift shop. There is no place in the world that can be compared to Urugo Women's Opportunity Center. Their facilities include a conference center, eco-lodge, full restaurant, and a gift shop, which are all staffed by women and are fully eco-friendly. Urugo needed a specialty coffee product that truly fit the mission of the center, and could be used for their multitude of coffee services without consuming large amounts of electricity. 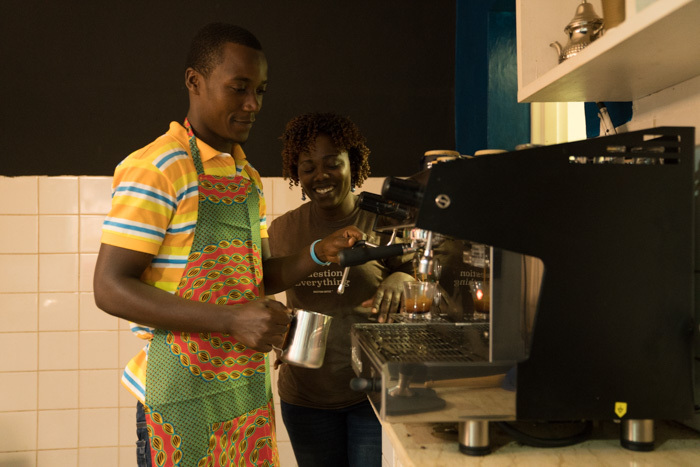 Urugo WOC uses Question Coffee as a core product of their road-side specialty coffee bar (a perfect stop on the way to Akagera National Park), a refreshment in their conference center, and as a delicious addition to their gift shop. With over 60 full-time employees in Rwanda, UNICEF has a large number of mission-driven, passionate staff to fuel. UNICEF approached Question Coffee to help deliver a coffee service with purpose. First, the supply chain had to be transparent and fair. Next, the product had to both delight guests and remind employees that UNICEF is a great place to work, with access to coffee service on all three floors of the building. Finally, it had to fit the modest budget of an NGO. As an added bonus, we launched a consumer education program with the UNICEF staff to teach them about coffee at our farm to cup facility in Kigali, where they toured the coffee supply chain from the plant nursery to the roastery to the tasting table.